How Can Elbow and Forearm Pain Be Taking Away from Your Finisher Results? Last weekend, I was teaching a course at a local college and a participant in the class asked me about his forearms and elbows pain. Let me share with you what I let him know about his forearm and elbow pain. The fellow in my class was fatiguing out the forearms when he was doing rowing exercises before his back fatigued out. When it comes to your body, you are as strong as your weakest link. When exercising, if you have weak knees, you are limited with how much you can do because of them. This limits the exercises you can do and how hard you can go, which ultimately affects your fat loss results. If your weakest link in your upper body is your elbows or forearms, this limits how much upper body work you can do. You will end up plateauing out in the weights that you can do when it comes to upper body exercises like bench press, rows, curls, and presses. Plus you will fatigue out in exercises like burpees, push-ups, close grip push-ups, cross-body mountain climbers, inch worms, inverted rows. Many more finisher exercises will be tough to do, or painful. If you can’t do as many reps of the finisher exercises, you don’t get as much fat loss results. The weakest links in this fellow’s upper body were his forearms and elbows, which were affecting his results. #2 – Do You Get Pain in the Wrist with Push Ups? This is also another classic sign that your forearms and elbows are the weakest link in your upper body. If you have sensitivity in your wrists or forearms when you do push-ups or are in a push-up position, it highlights the fact you need to work on your recovery and pre-hab work in your forearms and elbows. 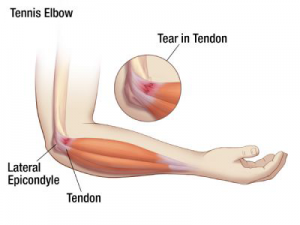 From working out hard, we often times get adhesions in the forearm. Adhesions are like scar tissue that sticks to the muscles of the forearm, forcing them not to work properly. The forearm muscles end up being weaker, fatiguing easier, and becoming shorter due to these adhesions. #3 – What else could be causing all of this? I hate to say it but your computer. Constantly typing on your computer at home and work ends up shortening the muscles in your forearms. This leads to the muscles shortening up even more, which will affect their flexibility, their strength, and how quickly they fatigue. #4 – What is another thing that could be causing things? If you are sitting down with poor posture, it puts greater stress on your shoulders and more stress on your elbows. Try to do a push-up on the wall. The first time you do the push up on the wall, be in very poor posture. Make sure your shoulders are rounded out and your head is dropped down. Where do you feel most of the work happening? You got it: in your forearms, elbows, and wrists. Now do the push-up on the wall with perfect posture. Make sure your upper body is in good alignment (head-shoulders-hips-ankles in a straight line). Activate your scapular muscles before doing the push-up on the wall. Go ahead and do the push-up on the wall. Where did you feel the majority of the work and stress this time? You got it, in your chest. If you are working out and have poor technique (posture) in your upper body, the work shifts from the upper body to the wrist, forearm, and elbows. This will lead to overworking them and promoting those adhesions. I know you are working hard to get your fat loss results but you need to take care of yourself. If you are doing upper body work – which you should be doing because it will improve your fat loss results – make sure you are good to your forearms and elbows. When it comes to your body, you are as strong as your weakest link, and for many people, the weakest link in their upper body are their elbows. Make sure you watch your computer work and are doing your finisher exercises with great technique; if you don’t, it will lead to adhesions in your forearms, which will affect your fat loss results. That is it. Thank you very much for reading. Take care of those forearms and elbows. Rick Kaselj is a personal trainer in Surrey, Canada who specializes in designing exercise programs for clients recovering from injuries. Rick has trained thousands of clients and completed his Master’s of Science degree focusing on injury recovery. Rick shares with other fitness professionals, and exercise enthusiasts, exercises to help prevent your elbows and forearms from being the weakest link in your upper body. You can get more information about his forearm and elbow program by visiting http://fixingelbowpain.com/ .